These are what’s for dinner tonight! You’re craving meat, but simply don't know what to make and want to try out something new? The answer for a hearty, quick and easy weeknight meal is simple: ground meat. And we've got your dinner ideas right here. What’s your favorite recipe with ground meat? Leave a comment underneath the article! Ground meat is a dinner favorite for endless reasons: it’s inexpensive, cooks up fast, and can be used in so many yummy ways. With a variety of easy and delicious options to cook, ground meat is a fantastic ingredient for every taste and occasion. So, check out all of these exciting recipes using ground meat now! Every one of them is an absolutely must-cook and has the potential to be your new all-time favorite food as soon as you try it – we promise! Happy cooking! Our first one is an unchallenged classic of ground meat recipes. This dish calls for a combination of ground beef, mashed potatoes, and creamy sauce for a delicious version of Swedish meatballs. P.S. : lingonberry jam is optional, but highly recommended! In our opinion, this is one of the best German recipes with ground meat. 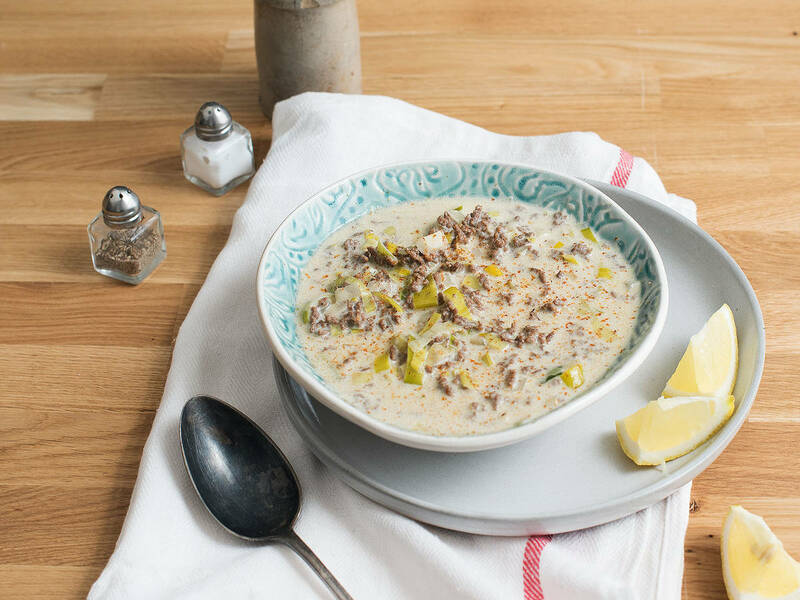 The typical winter soup is so simple and so deliciously creamy and hearty! It’s the perfect crowd-pleaser for spontaneous dinner parties, family birthdays (kids love it! ), or even as a quick weeknight dinner, since the preparation of this soup is unbelievably easy and only takes you 30 min. No ground meat recipe collection is complete without this tasty classic. If you crave meat, a freshly prepared burger is probably the first thing that comes to mind. This one is achieving the ideal proportion of juicy beef, melted cheese, sharp onion, crunchy lettuce, and tasty sauce, wrapped in a soft, toasted bun. Introducing the bell pepper, your new favorite vehicle for ground meat. This recipe will quickly become a secret weapon when dealing with stressful everyday life. It‘s just so easy to make, and, therefore, it’s also the perfect solution for hectic weeknights. Making this Italian classic just got even better. This easy meal combines two all-time family favorites – spaghetti Bolognese and lasagna! Try this unique recipe at home, and you’ll surely want to make it again and again. Is this still food, or is it heaven in a baking dish? You decide! The traditional British shepherd’s pie is the epitome of comfort food. This crowd-pleasing dinner is made with ground lamb and topped with mashed potatoes, baked to golden perfection. Last but definitely not least is this famous Tex-Mex frontrunner. Full of flavor, this chili con carne recipe makes artful use of ground beef, tomatoes, chilies, beans, and sweet corn to create a hearty, one-of-a-kind dinner. It’s a perfect dish to feed plenty of people and just so easy to make!